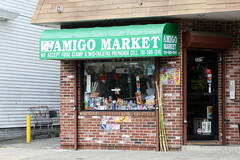 Evidence that a market is well-connected to the community usually suggests that the snacks are good, too. 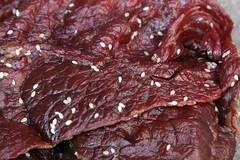 Beef jerky (by heft, about a quarter-pound, $5) was easy to tear, and a little sweet. 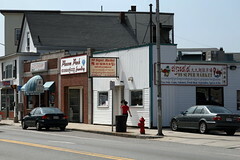 (This venue is closed.) Supposedly this was a less spicy option. During a daylong expedition, this was the best-stocked Cambodian market I came across, and the most self-aware: On the flatscreen near the register, Andrew Zimmern cautiously eyed various bizarre foods of Asia. 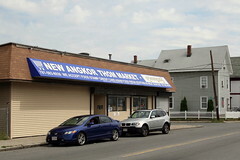 Frozen mudfish heads, which populated the freezer, found company in many fresh, local fish that might well feature on the menu at Mittapheap, two doors down. 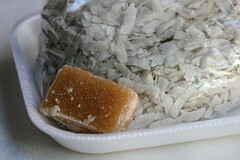 These rice flakes ($1.25) are eaten with shavings of palm sugar, though if you roll a banana in the flakes, no sugar is needed. 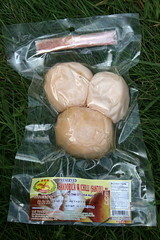 Preserved sandorica, (300 g., $1.99), also known as santol, santal, and faux mangosteen, imported from Thailand. Needed more chili salt, shown in the thin bindle at top. Better yet — assuming you're nowhere near a supply of the fresh fruit — the preserved dried version is equally tasty and less fussy. 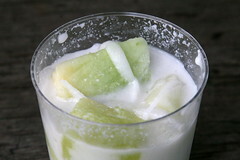 Melon and coconut in coconut milk ($1). I couldn't determine the English name of the torpedo-shaped, green-fleshed melon in question. 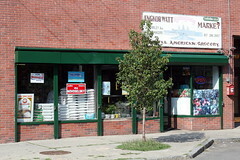 Also on offer: frozen, imported mangda na (four for $3.99). 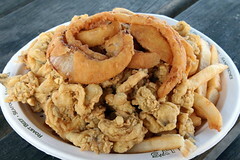 Onion rings and french fries were only scaffolding for my clam belly platter ($16.95); this was not unexpected. 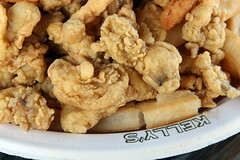 The shellfish themselves, however, tended toward firm and tight, a virtue for beach bodies but not for clam bellies. Guatemalan bakeries prepare a vast repertoire of sweet breads, often taken with, if not dunked in, coffee. The distinctions, however, are more about style than substance: They might look very dissimilar, but texture accounts for much of the difference in flavor. This sweet bread (50 cents) is called a "chicken," owing to the spread of its "feathers." 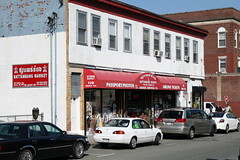 By most external indications, this is just a general store selling sundries of the packaged, mostly nonedible variety. A hint to the contrary, confirmed by a quick peek inside, is the bundle of sugarcane stalks tied to the frame of the security shutter.